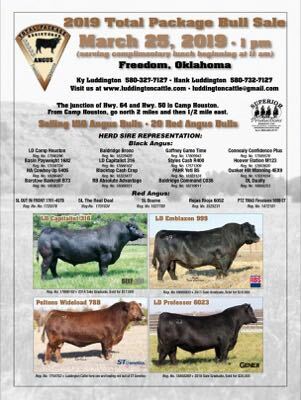 Luddington Cattle is a fourth-generation, 500-cow, working ranch located in the scenic hills of northwest Oklahoma near the rustic town of Freedom. There is some rather interesting history concerning our ranch. 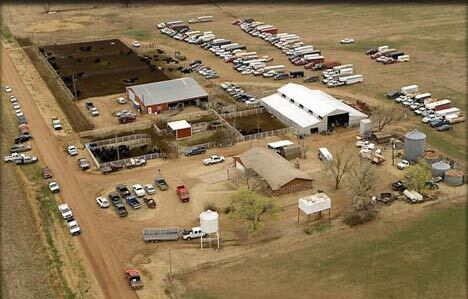 Our ranch headquarters sits on top of what was once the old Freedom Hotel. In 1919, the railroad came through from Waynoka to Buffalo along the Cimarron River so the town up and moved to its present location five miles south. The 160 acres east is the claim my great-grandfather French settled in the Oklahoma Land Run. My grandfather, Hank French, was the youngest of nine kids raised on that quarter in Old Freedom. My great-grandfather, Van Erck settled on the quarter west and ran a store and a filling station. We began our registered herd in the early nineties by bringing some of the most proven cow families from top performance herds in Kansas and Montana and putting them in the same environment our commercial herds were expected to produce in. Our goal was to breed multi-trait cattle that would continue to improve the bottom line for commercial customers. I wanted it all functional cattle with structural correctness, calving-ease, fleshing ability, performance, carcass, fertility and disposition. We have spent the last several years implementing an extensive A.I. and embryo transfer program. We have facilitated every available means to do performance and carcass testing and to gather ultrasound scan data. We then use that data combined with careful evaluations including structural soundness and fertility to cull, in some cases, complete cow families that donêt measure up. Although the cattle industry is constantly changing and single-trait emphasis seems to be popular, our commitment to breeding functional females will never change. Our livelihood is NOT dependent on our day jobs, oil wells, stock holdings or inheritance. This is not a hobby, tax break or a way to relax after a long day at the office. My point being we are totally dependent on one thing, the productivity of our Angus cows. In our business itês not what you do right thatês important, itês what you do wrong. Complete cow herd dispersions preceed bankruptcies or follow funerals and as far as talking about what weêre going to do after we retireÄno need for thatÄweêre already doing it.